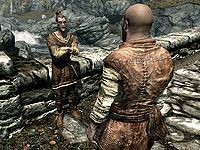 Gwilin is a Bosmer citizen and a resident of Ivarstead. He is the apprentice of Temba Wide-Arm and helps her out at her sawmill. Lately, he has been having some arguments with his mistress, no doubt related to their growing problem with bears. Like his employer, Gwilin is a permanent resident at the Vilemyr Inn and he sleeps there every night between midnight and 5am. After waking up he starts the day with a one-hour breakfast in the taproom until his workday begins at 6am. He then spends ten hours chopping firewood near the sawmill, at times conversing with the ill-tempered Temba. At 4pm he returns to the inn for a one-hour dinner, then spends the evening in the taproom until his bedtime at midnight. He wears a belted tunic and a pair of boots. He is equipped with a leveled dagger which can be up to elven quality at level 20, and carries a leveled gem, as well as a selection of common loot and gold. Despite his frustrated employer and his hard work, he is always cheerful and will greet you with: "Hello, my friend? What can I do for you on such a fine day? ", "I hope life's treating you well, friend." and "Such a fine day, smell the air! Isn't it wonderful?" However, before you have solved the bear problem he may also greet you with: "Those bears are making Miss Temba so angry. I hope you can do something about them." After the quest is completed, he will thank you for making Temba a happier person: "Miss Temba is much happier now that you took care of those bears. She may not look like she is, but I can tell." 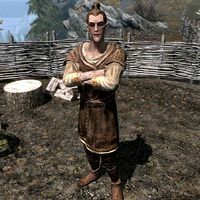 Like all other Ivarstead citizens he has an opinion on High Hrothgar: "Always thought it was odd that there's a layer of thick clouds covering the peak of the mountain above the monastery. Not sure what's up there, but I bet the Greybeards know." He will also tell you why he is so filled with joy: "My father taught me an important lesson many years ago. He said 'Gwilin, you have the whole world before you. Go out and experience it... be whatever you want to be.' So I took his advice, and here I am. This life might not look like much to you, but I'm content, and isn't that all that matters?" and bid you farewell with a cheerful: "Have yourself a great day!" "On your way up the 7,000 Steps again, Klimmek?" Wilhelm: "I heard Temba yelling at you yesterday. Why do you let her treat you like that?" Gwilin: "If you'll pardon the expression, she's far more bark than bite." Wilhelm: "Perhaps, but abuse is abuse. I don't think I could stand it." Gwilin: "There's much more to worry about in life then [sic] a bit of a temper, my friend." This page was last modified on 19 June 2014, at 22:13.